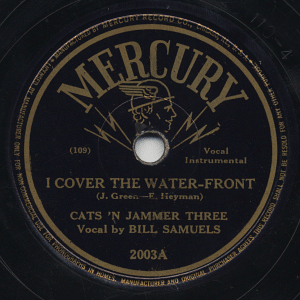 The 2000 Series was used for 78rpm single releases, since the Mercury's very start in 1945. Another early series, 1000 Series, was for 78rpm album releases. All kinds of music was distributed under this 2000 series, but until 1946 or so, Mercury divided into several series - 3000 Series (Popular, Big Band), 5000 Series (Popular), 6000 Series (Country) and 8000 Series (Black Music). The last title before splitting was 2075. By the way in 1949, Polka music became a huge boom, and Mercury re-used the 2000 series (2076 and on) for Polka releases. These Polka series were also under 2000 series, but may be treated as different series from the original 2000 Series. 2095 Tonight By Candlelight c/w Sorry Polka Joseph Lasicky unreleased? visitors to this page since June 15, 2005.